Listen up, guys--I've got something important to talk about. One of my sister's closest friends from high school is battling leukemia. She is currently preparing for a bone marrow transplant after (good news!) finding a perfect donor match. Until recently, I never realized how rare it is for someone to find a match, even though the Bone Marrow Registry is 12 million strong. My family is involved in hosting a bone marrow drive to get more people to join the registry. The process of registering and actually donating if you are ever selected seems to be full of myths. I always envisioned the whole "huge needle in the hip" thing, and since I suffer from needle-phobia, this possibility sounds terrifying. But that's not the most accurate picture. In talking with my mom, I learned that all it takes to register is a cheek swab, and if you are a match at some point, there are two different ways to extract blood stem cells. One involves removing the cells from the back of your hip, but the other is from your arm, much like donating blood except that it requires a few shots in the days prior. Just a couple days ago, I ran across an article in the August issue of Marie Claire on bone marrow donation. "Made to Match" tells the story of Caitlin Emma, a college student who donated bone marrow to a child with leukemia. It walks through the whole process, acknowledging the many myths and giving the straight facts on what Caitlin went through to donate--and save a life. Be the Match doesn't charge people to join the registry, but they still greatly need donations. 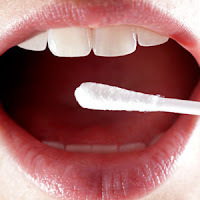 While it's free for those who sign up, it still costs Be the Match $100 per person to do the necessary tests on the cheek swab samples. Donations of any size are welcome and much appreciated. Even just $5 or $10 can help add an extra person to the registry, and, as we've seen, when you're looking for a match, all you need is that ONE person. When it takes longer to find a match, people's diseases have time to worsen, their finances become more and more strained, and their treatments get increasingly desperate, trying to buy themselves just a bit more time. By joining the registry, you could end up being the one person to put an end to all of that and allow them to get their lives back. To sign up, it's just a cheek swab and some paperwork [go to marrow.org to order a cheek swab kit]. Most people never get called to donate, but, if you do, there are two different methods of stem cell collection. They either take stem cells from the back of your hip (for this procedure, they put you under general anesthetic) or from your arm (very similar to donating blood, but you have to get a few shots in the days before). If you have any other questions, marrow.org has all kinds of information about signing up, as well as the donation process. Update: Visit M's blog for more information on the upcoming drives in Johnson County, KS and her fundraising team. I think that this is very important information to get out there. Through my work, I have become very familiar with the bone marrow donation process, and how much research is going on in this field. I wanted to point out that you can also help by donating umbilical cord blood to public cord blood banks. Umbilical cord blood is also rich in stem cells, and can be used to treat many of the same types of diseases as bone marrow. Cord blood is even more unique, however, as it has been shown to engraft even when there is a slight mismatch between the donor and the patient. Cord blood that is donated to public banks is also entered into the bone marrow registry, so it is just as easy for patients to be matched. Not all hospitals provide the option to donate your cord blood, but if they do, it has the chance to save someone's life. Julie - Happy to help spread the word. Hope the drives go well! Hutch - Thanks for the great comment! That's important information for anyone who is in a position to help. Such great information here! Thanks for sharing. And my thoughts and prayers go out to your friend and her loved ones.